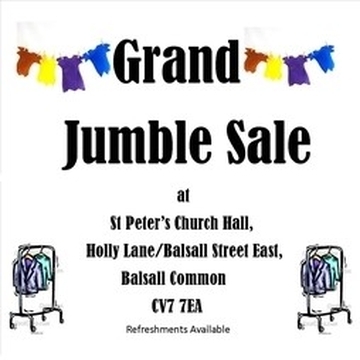 The traditional regular Church Jumble Sale once again will open its doors again in September 2019, to help you empty your attic, buy bric-à-brac and clothes for pennies, and enjoy a social activity at the same time. If you have anything that might be worth selling - childrens toys, crockery, small items of furniture like sidetables, you can bring it to the Hall on the evening before (or in the morning). Contact us if you need help - by email (mailto:spcbalsall@gmail.com) Or indeed, if you'd like to join the team organising the event or as a volunteer selling stuff. Note however, that we cannot accept large items of furniture (sideboards, armchairs etc) or carpets, as if it does not sell, we have to pay to get it taken away! Note - there is a small admission charge. In the Autumn we hope again to be offering "Early access" at specified times in the morning up to the lunchbreak for a payment of £5.00 'upfront' plus usual negotiated prices for items. This will be subject to availability, refreshment breaks for the 'staff' volunteers etc. All at 'management' discretion. Please contact us in advance to agree a time for you, as there is limited availability for these opportunities.